"We've hit a rich songwriting vein"
A few months ago, U2 were looking to release their new album, tentatively titled No Line On The Horizon, in November of this year. Now it looks as though fans will have to wait a little longer. From southern France, where the band is currently recording, Bono writes on the band's website, "We've hit a rich songwriting vein. It gets a bit dark down here but looks like we've found diamonds not coal. I thought a while back we might have the album wrapped by now, but why come up above ground now if there's more priceless stuff to be found?" Describing the sound of the new album, Bono says that it will be a return to the band's more iconic albums. "It's a brand new chapter for us," he writes. "Everyone we've played the tracks to has said that musically it feels like another departure. "The last two records were very personal, with a kind of three-piece at their heart, the primary colours of rock - bass, guitars and drum. But what we're about now is of the same order as the transition that took us from The Joshua Tree to Achtung Baby." 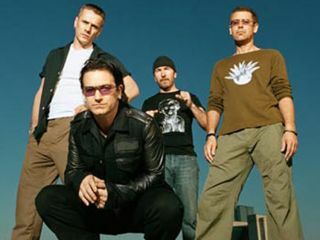 Bono adds that the band won't leave the studio until they believe they have exhausted themselves creatively. "We know we have to emerge soon," he writes, "but we know that people don't want another U2 album unless it is our best ever album. It has to be our most innovative, our most challenging, or what's the point?" They're taking their time, but Bono stresses this will be no Chinese Democracy. "Early next year people will be able to start hearing what we've been doing. We want 2009 to be our year, so we're going to start making an impression very early on."